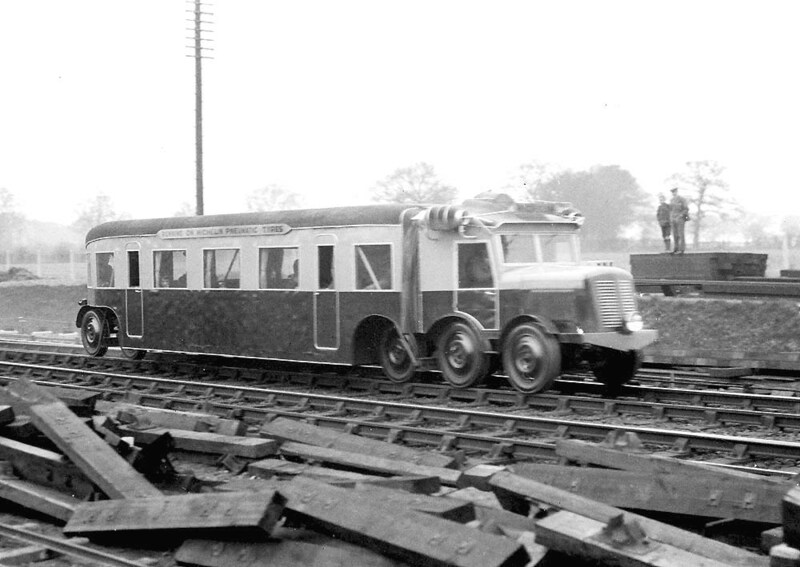 View of the experimental Michelin railcar being trialled on the GWR as it passes through Widney Manor station in the 1930s. The Rail Car, which ran on tyres and was said to be very quiet, was not adopted by any of the rail companies although the LMS, who also tested the vehicle, seemed sufficiently convinced by the possibilities of pneumatic tyred railcars to test other versions of the design. (A number of photographs of the Coventry Pneumatic Rail Car are seen in images 'lnwrk161', 'lnwrns1732', 'lnwrlave1349', 'lnwrlave1349a' and 'lnwrlave1362). Darren Kitson writes, 'The above photograph shows a Type 9 railcar in action. Examples of both the Type 9 and the Type 11 came to the UK as well as the Type 22'. The Michelin railcar was reviewed in the 16th February 1932 edition of the magazine Commercial Motor. A Striking Demonstration of the Michelin-equipped 24-seater Car on the LMS. Line. In recent months we have made several references to, and given descriptions of, various features of the Michelin pneumatic tyre for rail vehicles. We have now had an opportunity for participating in a demonstration under normal conditions with a full load. Dealing first with the tyre ; this is of the straight-sided type with a split, detachable outer flange to the wheel rim. The tyre dimensions are 910 mm. by 125 mm., whilst the wheel is removable from the hub in the ordinary way; a change of wheel takes about five minutes. On each wheel is a permanent pressure gauge; should this record a drop of more than 14 lb. below the normal 85 lb. per sq, in. there is brought into action an automatic electric warning signal. This scheme obviates the risk of running with a deflated tyre, except in the case of an instantaneous burst. Behind the fixed, metal guiding flanges are rubber inserts which effectively deaden noise due to lateral motion of the car ; there is no clanging or 'shriek' when cornering. Tyre life has been found to be some 20,000 miles and the permissible load per wheel is 121 cwt. Next, as to the vehicle; the model demonstrated is known as Michelin type 9 and has a 27 h.p. sleeve-valve engine of Panhard and Levassor make, driving through a clutch and four-speed, unit-mounted gearbox. A separate reverse gear allows all four speeds to be used in either direction. The drive is taken to the four wheels at the front; the remaining six wheels are purely load carriers. Heating of the passenger compartment is effected by air pasting over the exhaust; electric lighting and starting are provided and control is as in road vehicle practice with exception that steering is not necessary. Braking is similar to that of road vehicles; Lockheed operation controls shoes in the drums of all 10 wheels. This type-9 machine weighs 5 tons (empty), and will carry 24 persons plus the crew one man can control the car. It is claimed that the machine can cover 12 miles on a gallon of petrol. The pneumatic tyre is equally suitable for light railcars, having oil-engine or electric propulsion. Its use entails marked economy, both as to capital and operating costs. The Michelin Tyre Company Ltd, Stoke on-Trent, in collaboration with the LMS, ran the Michelin from Bletchley to Oxford and back with a full complement of passengers. Easily the most outstanding feature about the run was the silence; there was no 'clicking' as the wheels ran over the joints in the track, so that the familiar indication of train speed was absent. The engine and gearbox produced no sound audible to the passengers; apart from the speedometer the sole impression of speed could be gained from objects beside the line. Also when standing beside the permanent way and being passed by the railcar at 92 m.p.h. there was merely a 'swish'. By reason of the three times greater adhesion between the pneumatic tyre and the rail, as compared with the steel wheel on the steel rail, braking and acceleration can be far better than in ordinary railway practice. From rest we attained 40 m.p.h. in 38 secs., 50 m.p.h. in 1 minute, and 60 m.p.h. in 1 minute 45 secs. The normal cruising speed is anything up to 55 m.p.h. From 10 m.p.h. the car stopped in under 10 ft; actually it can be stopped from 60 m.p.h. in 210 ft. This suffices to show that present railway standards can be exceeded by any amount which is commercially practicable. The general riding qualities of the car were marked and the steadiness in all circumstances was equally noticeable. Darren Kitson writes, 'While such articles are now a valuable historical record, the Commercial Motor article, in typical journalistic fashion, is rather dubious in respect of accuracy e.g. its claim the railcar whizzed along the Oxford - Bletchley line at 92mph fully loaded. Whilst that figure is specific rather than given as, say, 'around 90mph' which would suggest guesswork, it is doubtful the Type 9 could attain such a speed; 55 - 60mph being the usually quoted figure. The article also states the railcar was suitable for 'oil or electric' propulsion. 'Oil engine' is a now somewhat archaic term for a diesel engine and as we have seen it was not possible at that time to equip these railcars with diesel engines. Nevertheless even today some people, who in many cases ought to know better, still describe these railcars as 'diesel'. Electric propulsion was also a somewhat ridiculous claim as rubber tyres would not provide the current return path necessary with overhead wire or conductor rail power supplies. Battery power would in theory have been possible but the ever-present problem of battery weight would have made it completely impractical for the Michelin railcars which through necessity had to be lightweight'. The Michelin Rail Car performing on Dutch Tracks. Its similar to that trialled in the UK.